"NanoCom-Network" is designed to develop cooperation between european and latin american institutions in the field of advanced processing and characterization of micro and nano composites. The network is made up of 2 Universities in Europe (Universität des Saarlandes, Germany; and Technische Universität Wien, Austria), 1 Research Center (Helmholtz Zentrum Berlin, Germany) and 4 Institutions in Latin America (Centro Atómico Bariloche and Universidad Nacional de Río Cuarto in Argentina, Universidade de São Paulo in Brazil and Universidad de Concepción in Chile). The purpose is to combine the different thematic specialties of different experts in the multidisciplinary field of materials science in order to design new composite materials with superior properties and performance. The duration of the project is from May 2010 until December 2012. During this period, a total of 39 exchanges will be carried out comprising a total amount of 55 months and 30 materials scientists. 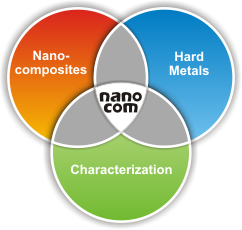 To exploit different abilities of a well-renowned group of scientists towards the development of new high performance micro and nanocomposite materials for electrical, thermal and mechanical applications, including the advanced production techniques and modern characterization methods. To enhance cooperation activities between EU and Latin American institutions, improving accessibility to different research facilities of the network members as well as the knowledge and experience transfer between the partners. To improve career perspectives of early-stage researchers (ESR) by providing them with a multinational, interdisciplinary, high-level research training in Materials Science and Engineering.